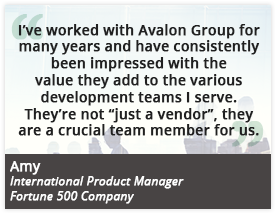 A mid-sized local instrument company asked Avalon Group to write a user manual for a hand-held, installation meter they had created. Our assigned Project Manager quickly came up to speed on the product’s features and intended audience, working seamlessly with both the client and the vendor that had developed the installation meter’s firmware. We created an easy-to-use and understand user manual, a novelty in an industry known for complicated and cryptic user documentation. Our extensive knowledge of desktop publishing software let us quickly devise an appealing document format that met the company’s marketing guidelines. After the installation meter was launched in the field, it came time to roll out a firmware update. Avalon Group was able to quickly provide a second revision of the user manual, leveraging our prior product knowledge. We continued to support the product throughout its life.